Tom is busy working 5 days a week but is happy. He works in Longview on Monday, at Willamette in Vancouver on Tuesday and the amazing Discovery Dental on Wed-Fri. He signed up for the Mountain Marathon again, insane hilly, muddy, practically run through ponds, marathon. So he’s training for that, but what has really captured his heart is crossfit. We joined a new gym just 1 mile from our house and are both in love. I could write an entire post about all the things we love about it and if you’ve seen us recently you’ve probably been stuck listening to us go on about how amazing it is! 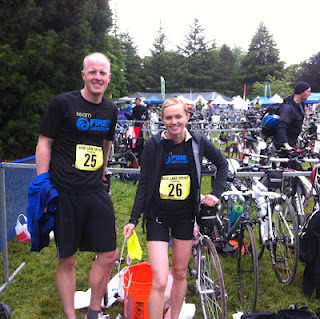 Short version- we love the people there, the moral support as well as the competition. We love doing new and interesting things all the time and being pushed harder than we thought our bodies could handle and then coming back the next day. On top of all the working out fun I am also busy with all the normal things of life. I spend a lot of time helping out down at the school and enjoy being involved in the kids classes. At church I serve with the young women and just got called as camp director. Having Alyssa at school 2.5 days a week also gives me time to go to the temple every other week and just help out with all the things that need to be done in a busy active ward and community. As always, there are never enough hours in the day. But my life continues to evolve as I change from a young mom with young kids to just a “mom.” The kids are more independent and have much different needs. We have been painting the interior of the house and it just gets better every day. I am sure the project list will be long for a few years to come but bit by bit we are making it home. We are storing a pool table for a friend for the next 6 months so that is taking up the space in our empty front living room and providing lots of fun. Sadly our appliances are breaking down even though they are only about 8 years old, first the microwave, then the oven and now the dishwasher. I got to spend the afternoon waiting for a repairman. Hayden is 10 and enjoying the independence he now gets. He actually babysat his sisters one Saturday night while we went to do karaoke and did a great job!! As always he is hopelessly addicted to Minecraft and all video games, a battle we re-fight daily as we force him to choose other things to do with his time. He just finished Hunger Games and is still plowing through The Lord of the Rings. We forced him to sign up for baseball for one last year just to get him outside, that starts in a month or so. His love for band continues and one day Tom took him to a music store and he came home with his eyes all lit up excited to tell me that he saw a bass clarinet. He still enjoys school and does well even though he will tell you that SCHOOL means Six Cruel Hours Of Our Lives. He only has a handful of friends but he told me “mom, that’s all the friends I need. I’m not Danica who needs to be friends with the whole world!” I guess he doesn't need friends because he gets to torture his sisters. Danica does love her friends and would be happy to just draw or play all day. She barely tolerates school most days and hates being gone all day, every day, but she is excelling in her classwork and is the top reader in her class. We have had to make a new rule about not doing hand stands and cartwheels at the dinner table...who knew... but she just can‘t stop herself from doing them all the time! We've all been victims as she has kicked us in the face when she spontaneously did a cartwheel while walking down the hall. She did a week long after school cheer camp at the high school and has fallen in love with dancing. It was hilarious watching her shy self trying to break free to cheer and yell. She hardly moved. But her desire to dance comes at a good time because she needs to move up to the next level at gymnastics and doesn’t want the 9-12 hour a week time commitment that comes with that so we are taking a break from the gym and doing dance for a while. She also signed up for t-ball and asks me every day when t-ball is starting. Alyssa is a wild card as usual. She is trying to figure out what she likes and who she is and it keeps me guessing all the time. One minute she will be the star of the show and the next minute she is hiding behind my leg feeling shy. School is going well for her, she loves her class and is does well at her work. Her teacher said that the first day of school she was told to put down her paint brush before she was finished and ended up in a tug-o-war with the teacher. However, she must have decided that the teacher was serious because she hasn't had any trouble since then with her listening or obeying. So now the only problem is that she still has not had a turn to be the "star of the week" and it’s killing her...it’s a real long lesson in patience. She loved her gymnastics and is sad to be taking a break just because Danica has to but in the meantime I have her and Danica doing a little community ed tap/ballet class down at the elementary school and she is loving that. She is going to play t-ball but doesn’t want to because she is nervous to play against another team. Hopefully she will get over it. Mostly she is just loving being the baby of the family and walks around hugging her stuffed animals all the time asking me if I think she looks cute. Which I do. Like everyone else our summer was busy but fun, wished it had been a few months longer. Took a fabulous trip to Utah to finish it off, drove 11 hours on Labor Day to arrive in time for school to start. We have been very busy in our house with painting all of the rooms and some furniture and trying to decorate. Outside we dug up the grass all along our fence, had a truck load of dirt delivered and then planted a bunch of trees. They are small but they will grow. It's been a ton of work but we like the result. 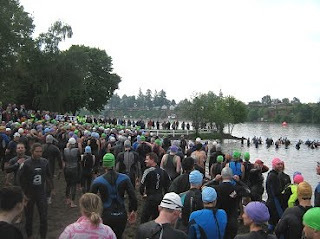 ** Did a sprint triathlon, a half iron man triathlon and an olympic triathlon this summer along with running in three different relays and two Oyster races. Yes, he’s a machine. ** Started a third job, he is now the emergency dentist for Williamette on Mill Plain on Tuesdays from 7-6. He continues to work in Long View on Mondays, being gone from 6:30-6 and has committed a year to both jobs. ** Loves Discovery Dental and hopes it just continues to pick up business. ** Loved that it was light out in the morning when I would run early in the summer. I miss it already and it just started getting dark. 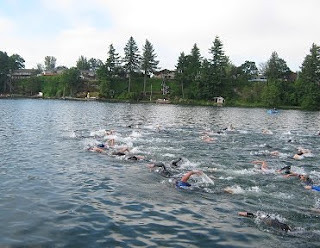 ** Swam in the Columbia River every week training for the Olympic Triathlon at the beginning of September. Very hard race but fun...I think you could call it fun. ** Loves new calling in Young Women’s working with the Mia Maids. Awesome girls and leaders I get to hang out with! ** Has been nursing a knee injury all summer, hoping it holds up for the marathon in 3 weeks. ** Has all three kids at school this is and is hoping that the promised free time will come eventually!! ** Loves 5th grade and not being new this year. Loves getting to sit in the back of the bus rides it every day even though I can’t get his sisters on it. ** Is playing fall ball baseball in hopes of getting his skills better so he will be ready for spring ball. He would still rather stay home on the couch but he is learning to tolerate it and is improving. At one of the games he got three hits and scored all three times! ** Got the scores back from last years standardized testing and he rocked it. It’s always nice to have that affirmation that he is in the right grade since it makes lots of other situations awkward! ** Has really gotten into listening to music and can often be found just sitting around with her ipod. ** Has been slow to warm up to first grade, it’s hard that it’s all day everyday, she just misses me too much but it’s getting better. ** Is thriving at gymnastics and is at the top of her class. She’s content to just stay with one day a week but if she decides to add on another day I am sure she would be ready to join the team. I’m letting her decide. ** Turned 5 in August and we had a carnival party with all her friends. ** She started kindergarten and is doing well. The novelty is wearing off a bit and she’s getting hesitant to go to school but she is always happy when she is there and is learning a lot. She’s much younger than Hayden and Danica were when they started school so she is really learning at school which is nice. ** She also started gymnastics, a class at the same time as Danica in order to simplify my life. She LOVES it and they make her really listen and follow directions so I love it. Well I was hoping to do it under 30 minutes so I at least met that goal, finishing in 25 minutes which is the speed (or lack of speed) I was finishing in during my training swims. I went in telling myself it would be okay that I would be last because I knew I would be but it was still hard to handle when it was happening! I had an anxiety attack around the first buoy thinking I wouldn't be able to do it and my heart started racing and I couldn’t breath but I did the back stroke for a bit and calmed down and managed to find a rhythm and caught up quite a bit finishing just a few minutes behind everyone else. Not dead last but close... but I did finish...through out the swim I tried to distract myself from the fact that I was out there all alone, with nothing to look at but grey water and nothing to listen to except my breathing so I was trying to think of what color to paint the kitchen. Not exactly the kind of thinking to motivate me to go faster but it did keep my heart from racing. I was so happy to be done but dismayed by how far behind I was! 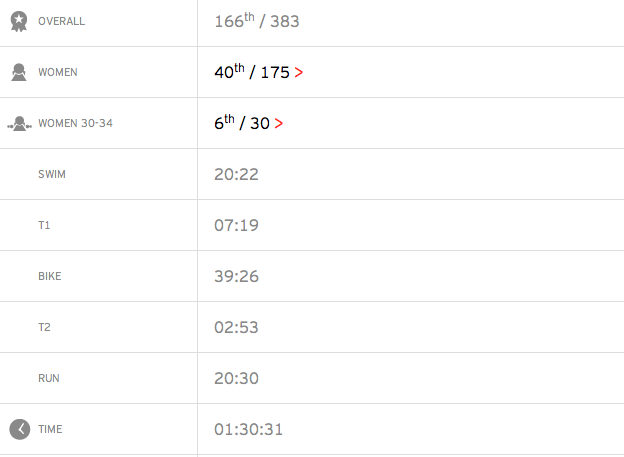 I tried to hurry through my transition but I was all out of sorts from the swim and I can see my transition time online and it wasn’t great. Oh well, I managed to get out on my bike determined to do my best and hopefully catch up to the other women! As I had come up from the swim I saw my friend Chelsea leaving on her bike and wished her well. I saw one other lady in the transition area but as I mounted my bike I was all alone and stayed alone most of the ride. I tried to tell myself to just enjoy it and not stress but I couldn’t help it. I was pushing it as hard as I could with every pedal telling myself that I could rest all I wanted when I got home that night but right then I had to give it my all! It felt like a really long ride and there were plenty of hills but I did enjoy the ride, I liked the scenery, talked to the few people I saw and got chased by a dog. I passed a couple people and finally at 22 miles I caught up with my friend and was excited to ride with her for a bit after being so lonely. I thought it would be finished at 24 miles so I pushed it hard. 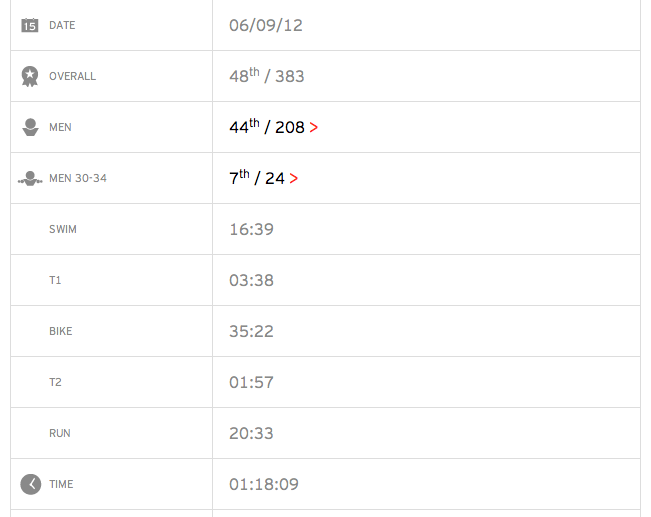 I finished with a decent pace around 17 mph, that's pretty good considering I usually average closer to 15. I just kept telling myself to give it my all instead of saving something for the run. I figured I would worry about that part when I got to the run! I was dismayed when the course just kept going and going and we didn’t actually finish until closer to 29 miles!! But I hopped off the bike, exhausted and still so far behind but determined to do what I do best: run. 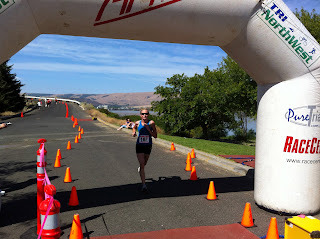 It was very hot and there was no shade but I kept telling myself "you're a runner, you can do this!" Every step took a lot of effort because my legs were so tired from the bike but I managed to convince them to keep going. My Garmin wouldn't turn on so I didn't know my pace or distance but that was probably a blessing since I was just focused on not stopping. I powered past the 1.5 mile water station and turn around for the sprint runners really wishing I was turning around too! But I had been looking for Tom so I was I was motivated to keep going. Not long after that I saw him and I threw my arms in the air in excitement! Here we were, we were actually doing it! He was on his way back and I was terribly jealous wishing I could turn around and run with him. But instead I was happily surprised when he stopped just long enough to give me a fantastic sweaty hug! We wished each other well and pushed ahead in our separate directions. The next 1.5 miles was the longest of my life. At one point I rounded a corner sure I would see the turn around and when I could see far off in the distance and there was no turn around I let out an audible cry of dismay! Honestly it was one of the hardest things I've done, I wanted to quit so badly. But I made it to the turn around and got some water. Then I headed back... I was so hot, so tired and my wet shorts were really uncomfortable but I just kept telling myself that if I would just get to the end I would be done. I kept making little deals with myself like “just run to the end of this song and then you can walk for the time in between songs.” But the song would end and I would somehow manage to keep going without stopping to walk and I would make a new deal with myself which I would inevitably not keep...I did stop for water at that 4.5 mark and then just kept making deals with myself to convince myself to run all the way back. I was more tired than I was after the marathon I ran. 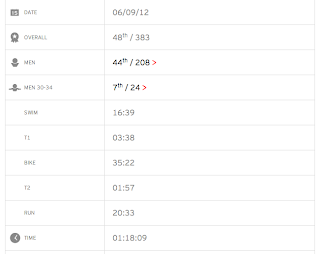 I didn’t know my pace at the time, but it turns out I averaged 7:27. Not bad considering my speed has gone down since my knee injury. Definitely not bad considering how exhausted I was. I'm happy I finished it. Glad I challenged myself and now I know I need to train harder in the future if I ever plan to do it again. One of the most exciting things that happened for me this past spring is that I was able to be a part of this amazing organization called First Descents and I ran the Hippie Chick Half Marathon on their behalf and won the race! The two things go together but are great in their own ways so I'll discuss the details seperately. First I'll tell you about the race. After the marathon I ran last October I decided I wanted to give myself a big physical challenge. One that would be hard but attainable. I was trying to train to tackle a triathlon but wanted to run faster. So I got the book "Run Less, Run Faster" from Runners World and set the goal to run a half marathon in a 7 minute pace. That's a finish time of just over 1:30. I knew it would be tough and it was, many early mornings in the dark and the rain out there running my intervals faster or pushing through a tempo run. I also had to keep up on the cross training of swimming and biking. It was a lot but it was working and I was getting faster. As the race approached I was running my long runs in just under 7 minute paces and I knew I could do it! What I didn't expect was to be the fastest runner at the race! I started the race with the front pack and just stayed up with them. 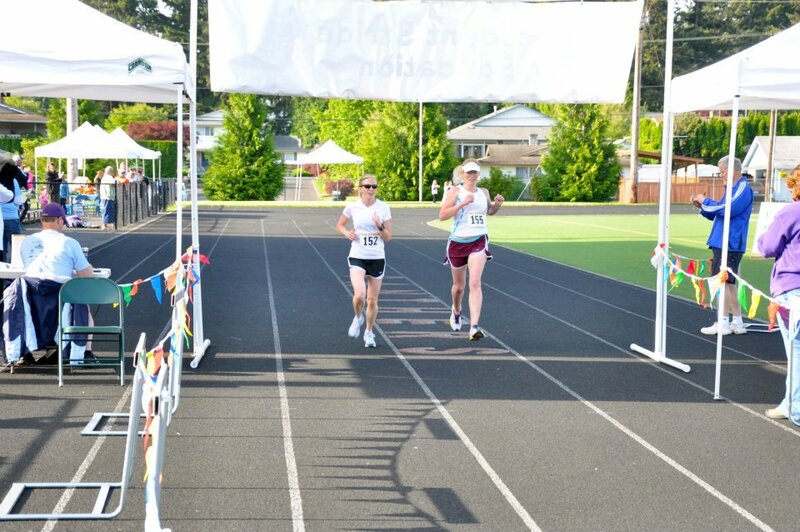 After the first mile I was one of the front runners and knew I needed to go even faster to meet my goal. I kept watching for someone to pull ahead but no one did and as I approached the 2nd mile I made the decision to just take the lead and run what I had trained for. 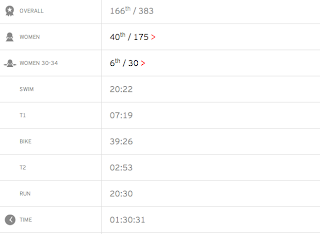 I was nervous wondering what made me think I should be the lead runner but none the less I just tailed the lead bike and monitored my pace as the miles flowed behind me. At about half way there was a turn around point that led you back the way you had come for about a mile before taking you down a different path. It was really exciting at this point because as I turned around and ran back I got to see my friends who were also running the race and all the other women who were so excited with the race. Women are awesome and so supportive and we all just yelled encouraging words at each other. I felt like a real celebrity as I passed them. By the time I turned off down the road alone again I was well over half way and knew that if I could just keep it up I would not only make my goal but maybe win the race. I didn't know how far back the next runner was and the closer I got to the end more I got nervous someone would blast past me right at the finish so I pushed on even harder. It was getting pretty hot by this point and I just kept reminding myself that it was nothing compared to all the running in Okinawa and I couldn't let it affect me. The last three miles were tough because by then I had met up with the 10K run/walkers so they were merrily walking along on the right while I had to push past on the left. They were great and encouraging but I felt like I was pushing so hard and going so fast compared to their happy walk that I was dismayed to look down and see my pace at times and know I had to step it up! Luckily, I was able to get back on pace and the adrenaline of wanting to meet my goal and win took over and I powered through to the finish!! It was pretty exciting. Tom, my parents and other family members were there at the finish line. My mom said she felt pretty special when the guy next to her said "Wow, she's amazing" and my mom got to say "Yeah, that's my daughter." :) After winning they grabbed me for a quick interview with the microphone and I was too overwhelmed to really think of what to say. I'm sure I sounded pretty lame mumbling something about the beautiful course. My running friends! The finish line! (You can see some 10K run/walkers behind me) You can see the race results here: http://www.racecenter.com/results/2012/res_p712.htm All around a great race, I felt great and did exactly what I had trained so hard to do. But the success didn't stop there. I entered the race on behalf of the organization First Descents. It helps young adult cancer survivors by giving them a chance to go out and face a fear or challenge other than cancer. They take them kayaking or rock climbing or even surfing. It’s an incredible week for the participants. I understand the need to push yourself physically and the strength that comes from it. It’s free for the participants and in order to do this they need to raise money and get people involved. Entering the race on their behalf meant that I pledged to raise a certain amount of money and then wear a First Descents shirt and represent them at the race to try to raise awareness of what they do. I was able to talk about them the friends on Facebook and through email. I wanted to get involved because First Descents has been a powerful influence in the life of our good friend Shanda. When they gave out the awards after the race I was able to take a few minutes at the microphone to tell everyone about First Descents and encourage their involvement. It was exciting! I'm so glad I got a chance to help support that is so valuable and life changing for those involved! I look forward to doing more. I was featured as the Athlete of the Week on First Descents web page. You can read more about First Descents and my experience and why I got involved by reading this entry from their website: http://teamfd.firstdescents.org/2012/fd/hippiechickhalf/stinchfield/ If you're looking for an amazing worthwhile cause to support you've found it!! Check out their website, watch their videos and read about what they do and then figure out who you can involved!! 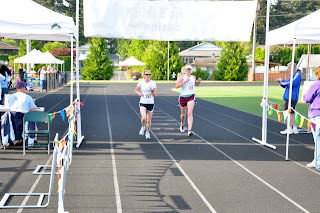 Back in May the whole family participated in an annual 5K race and kids fun run to raise money for the school district. Discovery Dental (Tom's brother's clinic) is the title sponsor for the event so the whole family comes out to support it. 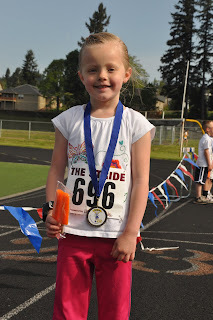 We were excited to be a part of it this year and the kids had a blast participating in their different age group races. They were in training for a few weeks leading up to the race and it paid off. 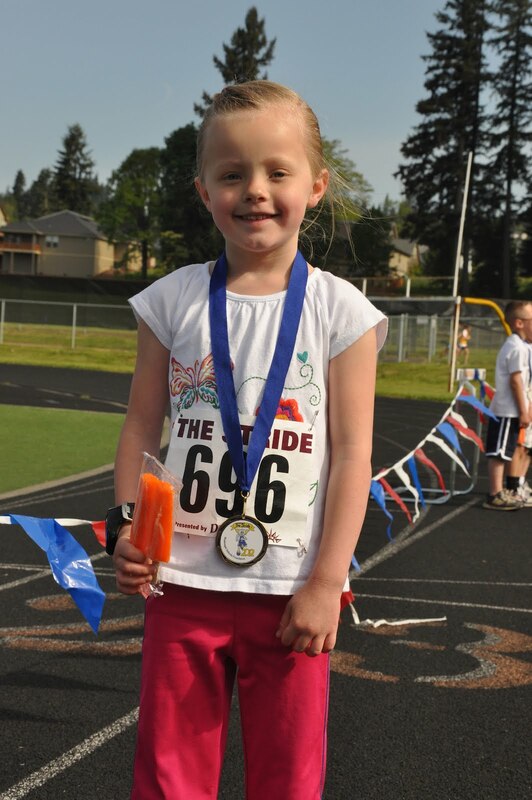 Hayden and Danica both enjoyed the runs and finished near the top of their grade levels. Danica said she got a cramp while running but just kept going anyway! That's my girl!! My running buddy Teresa and I ran it together and crossed the finish line as the first two women. Tom and Dave did a little contest with the community saying that anyone that could beat them both at the race would get movie tickets. Tom tried to slow down a bit but still only managed to let a handful of people beat him. All around a fun morning! Each group got to stretch and warm up...Danica's so flexible! She loves her medal! 4th grade cousins! I got to run with Alyssa! On June 14-15 we took the challenge and participated in the Epic Relay. It started in Beaverton OR, and ended in Eugene OR. It was 187 miles, 12 runners, two vans, 3 groupies (that would be Kenn and Barb and baby Brie), and a total blast. It's fun to be part of an extended that can not only tolerate each other enough to spend 30+ hours living together in a van but we actually enjoy it! There is a video contest so Adina put this together with stuff Dave shot using his awesome GoPro camera. It's amazing. It's only 5 minutes long and worth watching!! The End of an Era??? After three amazing years in Okinawa Japan we had to leave and have settled in the beautiful northwest city of Washougal Washington. We are right on the Columbia River Gorge and just outside of Portland. This is our final destination but the adventure is just beginning! Tom is happily working as a dentist at Discovery Dental with his brother. We are loving the out doors, the friendly people and all the races we can participate in. Now we just have to figure out how to slow down enough to enjoy it all because time is going way too fast!